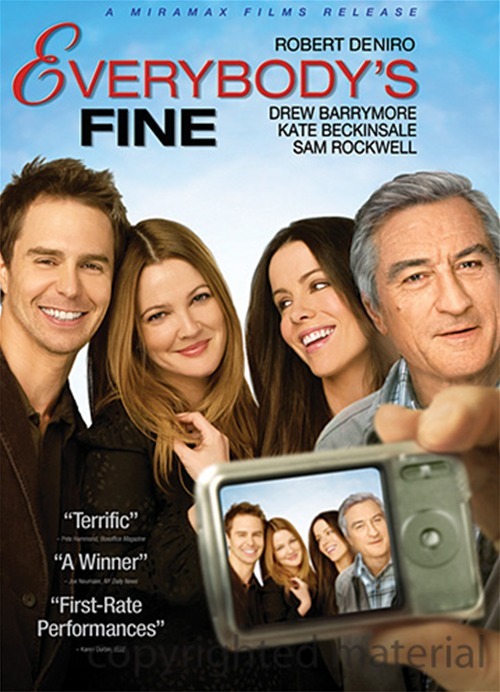 Based on the 1990 Italian film of the same name by Giuseppe Tornatore (well, it was actually entitled Stanno Tutti Bene in its native tongue), the Stateside incarnation of Everybody’s Fine, directed by Kirk Jones (Nanny McPhee), stars Robert De Niro (Taxi Driver) as a widowed, retired wire factory worker who travels across the country to visit his four grown children after they all separately cancel their plans to attend a family reunion at his suburban home. 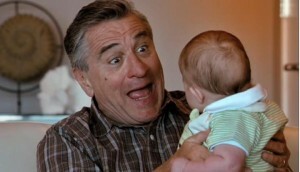 De Niro’s journey takes him to New York, Chicago, Denver and Las Vegas and his visits reveal that at least three of his four offspring (Kate Beckinsale of Underworld, Drew Barrymore of Going the Distance, Sam Rockwell of Conviction) lead successful, healthy lives, though they all seem a bit anxious to make sure there father doesn’t ask too many questions or overstay his welcome. Over the course of the film, we learn that the fourth child, a never-seen son named David, may not be doing well. And as for the other siblings, well, we also discover that in reality, everybody is not fine. Sentimental, yes, and obvious, particularly in that De Niro speaks so proudly of his children that you know something’s got to give, and as he’s a widower on regular medication, some sort of medical drama can’t be far behind. Noticeably mellower and portraying an “old man” for the first time in his career, De Niro is fine in the film, if a bit overcooked, delivering his trademark tics and smirks as if they were given designated times to emerge. The trio of talented actors portraying his grown children are also more than adequate, especially Rockwell as an addled symphony percussionist, but none are really given enough to do to make their stories exceptionally memorable. All four come together in the last fifteen minutes of the movie (the only time the leading players are all on screen at the same time) in a pleasant, positive ending that would have been more effective if it didn’t feel like it was going on forever. If the first rate cast appeals to you, then give Everybody’s Fine a shot, but if it’s the story that clicks, then stick to the original. But keep the title of Tornatore’s Stanno Tutti Bene in mind, because it receives nary a credit or mention in this version. The DVD does come with a handful of special features, but nothing too entertaining.